Your Urban Oasis awaits at the highly sought after Library Court residences! 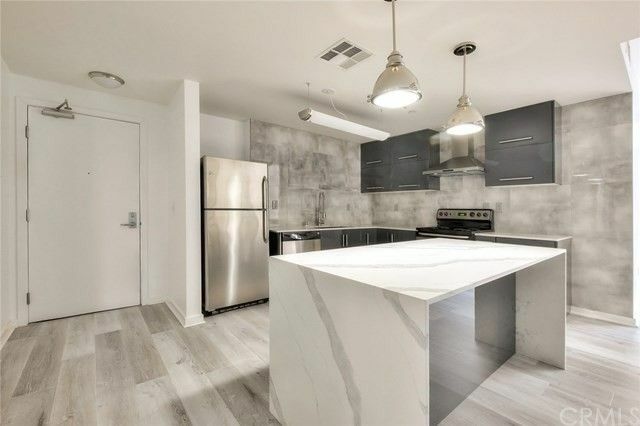 This stunning unit occupies the premiere corner location with terrific city views and ample natural light. A gorgeous remodel that is sure to impress offers high end modern finishes such as a fantastic Calacatta quartz waterfall island centerpiece.The stylish, functional and open kitchen design is highlighted by fully tiled feature walls, a stainless steel large capacity sink w/ retractable faucet, sleek high gloss soft closing cabinets and storage drawers and beautiful stainless steel vented hood. All of the appliances are GE stainless steel! A spa like bath features a deep soaking tub w/ Calacatta quartz panel walls, a modern vanity and toilet and large rainmaker shower head. New urban grey floors with sound proofing underlayment is utilized throughout the residence making for a modern and stylish finish sure to satisfy any buyers needs.The floor to ceiling windows allow you to enjoy natural light from your rarely available corner location with extra windows and glass walls to bring in the high rise, city lights and street views.A gated oversized tandem(with smaller cars)parking space within the building is included. Library Court is epitomizes the downtown LA's lifestyle that is no longer a secret and is within minutes to 7th & Hope Metro station, Central Library, dining on 7th & Grand, Whole Foods, Figat7th and 250 million dollar renovated "The Bloc" complex.Be sure to click on Virtual Tour link!